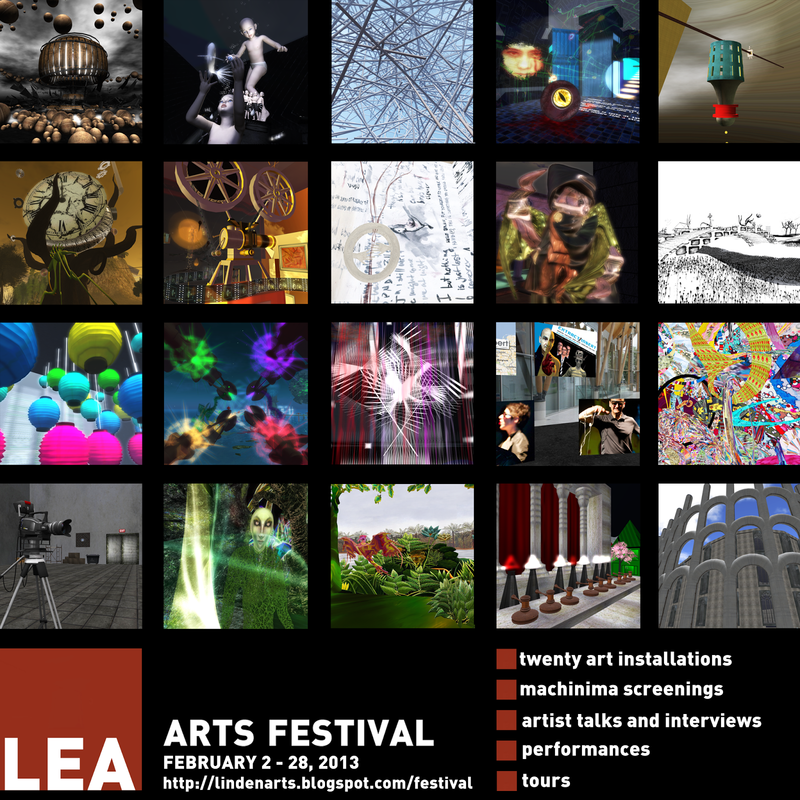 LEA Arts Festival - A Month-Long Celebration, Kickoff Day Feb 2nd! What better way to showcase the work of over 30 artists, performers, and machinimatographers, than with a month long celebration? 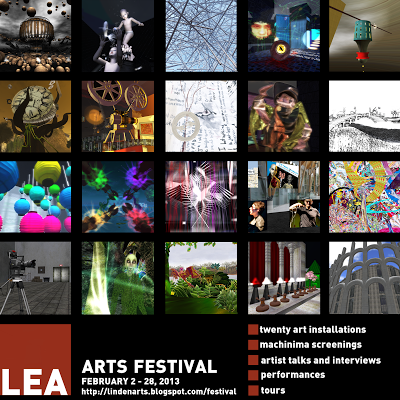 The LEA Arts Festival features twenty sims of art installations, machinima screenings, artist talks, interviews, performances, classes and more! Opening day is Feb 2nd with a schedule of great events, listed below. The Linden Endowment for the Arts not only provides grants of land to artists-in-residence, it also helps to promote the artists and their works through this festival, articles, interviews, social media and other avenues. For many artists, this festival is the culmination of 5 months of hard work and inspiration, and so the time has to fully celebrate and share these works. Please share your LEA Arts Festival related photography on our LEA Arts Festival flickr group, and on your google + or Facebook. We're looking forward to seeing you at the LEA! 1:00PM CEC Productions presents a new exciting Virtual Band Show: Leningrad Cowboys! Zachh Cale wrote the above and as it states I will be doing a talk on Challenging the Viewer (of your artwork). Just my perspective on exploring the virtual medium in areas which may cause you to lose some of your viewers. Should the artist create work which appeals to everyone or is it acceptable to create work that you know will be too complex for some of your viewers? Does the artist have a responsibility to create artwork which is simplified to the extent that it is accessible to everyone? All artists in SL will be able to apply to have a FULL SIM art show lasting one month each, and the closing date for applications is the 10th of Feb 2013. Imogen and the pigeons has now opened and it has been a very rewarding response. Actually not from everyone. There was one person who complained bitterly that I didn't create a work which would accommodate his very old crappy computer. So for anyone whose computer is run by a hamster on a wheel this build might not be for you. 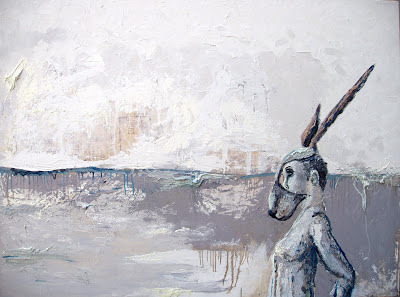 It was challenging for me to determine the right balance for the artwork in it being too difficult or easy to navigate. 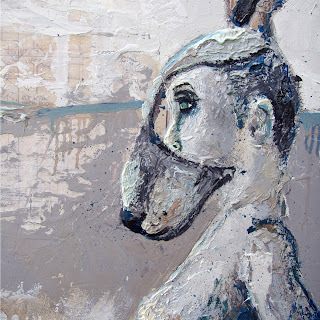 I was thinking that if I could create an early emotional response then that might allow the viewer to better interact emotionally at later stages, since their emotions have already been heightened and the immersion has begun. So in this case it was to create the sense of anxiety when climbing stairs up to the first part of the narrative. Many have said that their heart was racing during the ascent to the top where the story begins. That is really interesting because we get a fear of heights just by looking at our computer screen and associating with our avatar. There is a sense of accomplishment and relief once that first climb is complete because it has an element of difficulty to it. The next stage is slower in the cycle where you meet the Therapist and other characters in the ward. I think the change in pace at this stage allows the viewer to slow down and enter a different emotional state while exploring. Then once we reach Imogens room her story begins. I don't like to give clues or directions normally, but in this case I am going to because the next part can be a bit difficult to navigate. So Imogens reality is slowly falling apart and changing. The reasons are unclear at this stage but your reality warps with hers once you sit on the feather by her bed. Just sit on the feather and walk towards the wall. You will want to stay on the right side wall in the tunnel and follow the spiral upwards. Once you get to the door at the top you will see a symbol of a feather on it... that means you can stand up or take off the feather. But back to the feather itself. The key to using it is to just tap the movement buttons. Tap forward.. see where you are headed and make angle adjustments. Tap again and so on until you get comfortable. The worst thing you can do it hold down your walk button and just go mental all over the walls and things. I am evil it's true. This is not an easy build. I have included some images of a new oil painting which I completed not that long ago. It is self portrait of... well.. my avatar self. Over the last year or so I have been slowly building up paintings and music box insects inspired by working in our virtual world. I think it is interesting to note that when I first came to SL I brought in first life ideas to work on.. where now I seem to export SL ideas to my first life. Oh and I have some great news which seems to be a "for sure" thing now, though I guess you never really know. It appears that a Spanish Museum is interested in exhibiting my work a year from now with it possibly traveling to museums in Japan and Portugal as well. As the details become more concrete I will give out more info on the museums etc but so far it sounds exciting. I am going to attempt to get a region from Linden Labs in order to showcase other artists from here as well during the event.. but unfortunately pretty much every Linden I have met over time is now gone. I mean like.. who do I contact for things like that now? I remember for the World Expo in Shanghai a few years ago I spoke to Pathfinder Linden about it and he personally got excited over the project and took it to the top with a presentation to I think it was M Linden or whoever was CEO at that time. They gave Aino Barr and myself six regions to help promote Second Life during that event. It was great and the fact that a Linden lab employee was excited about an in world event was really refreshing. I mean for the LEA I can't even remember the names of the Lindens who are supposed to be our contacts. We have not spoken to one in a meaningful way for probably 8 months or so. They will help out and did so with the rearrangements of the AIR regions not long ago, but it doesn't feel like they are excited or partners but more like they just want us to run the LEA and leave them alone. Its what we want but .. still. It would be nice if they tried to force us to do something we didn't want to do so that we could fight with them over it... you know ... fight the faceless corporation and feel good about yourself afterwords because you stood up for something. Paint a picture of evil tyrants with hidden agendas.. which is likely just a fabrication in our own minds but.. you know.. who cares it works. Ah well. Anyway, start thinking up projects as the new round of AIRs (artist in residence) is approaching. My new build Imogen and the pigeons will open on January the 13th which is a week from Sunday. It is a immersive narrative with a layered story. This is the promo machinima. I will be restricting the sim to allow only 10-15 avs to reduce lag but really I do hate full openings where nobody can move or see the work. I will be there quite often to help people navigate the build. A wee bit tricky, but bring friends to help figure things out and you should be fine.